Who would you like to stitch with? Last week or maybe two weeks ago, Jane at Chilly Hollow posted this link: http://chillyhollownp.blogspot.com/2014/10/a-profile-of-brigid-berlin-straight.html. I relate to this but don’t we all! It got me to thinking, who would you like have over for a stitch-in (living or dead) and why? Barbara Bush? Cameron Diaz ? Julia Roberts? Drew Barrymore? Mary Tyler Moore? Loretta Swit? Kaffe Fasset? Rosie Greer? Julie Eisenhower? Mary, Queen of Scots? Marie Antoinette? Queen Elizabeth I? Martha Washington? Grace Kelly? Betty Ford? Erica Wilson? Mary Martin? Ann B. Davis (Alice the housekeeper on The Brady Bunch? Janet Leigh? Joan Rivers? Or just the friends down the street? Notice that many on this list are no longer with us and that is what will happen to our art if we do not share it with others. I know that it is not an inexpensive art…but you can keep the costs low by using floss and perle cotton. Do you think your friend, daughter, son, granddaughter, grandson, niece or nephew will care if you use cotton floss or silk? You can buy small frames or make one out of foam core…or just stitch it in your hand. Do you have a piece of needlepoint that you can carry around and stitch while waiting in a doctor’s office, waiting for an airplane flight, on an airplane flight, watching a game (kids, grandkids or professional). Instead of reaching for the phone to access the internet, try reaching for a small needlepoint piece. People will ask you what you are doing. Educate them. Offer to teach someone to needlepoint. 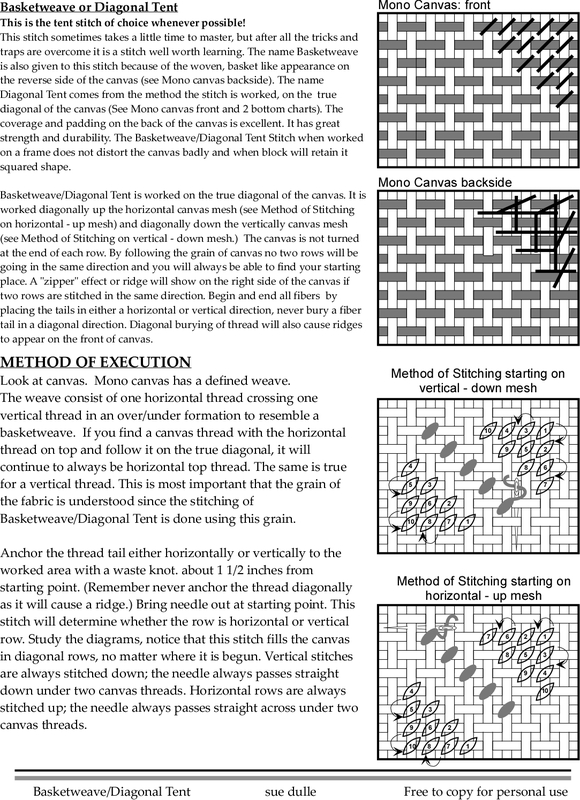 I am including a basketweave documents that you can print and share with a new needlepointer (If you would like a PDF version just email me (email address to the right). Please teach someone to basketweave, because when they do become addicted (and most will) they will want to take those fabulous classes that use those fabulous threads and stitches. BUT the teacher teaching the class will assume that the students know how to basketweave. 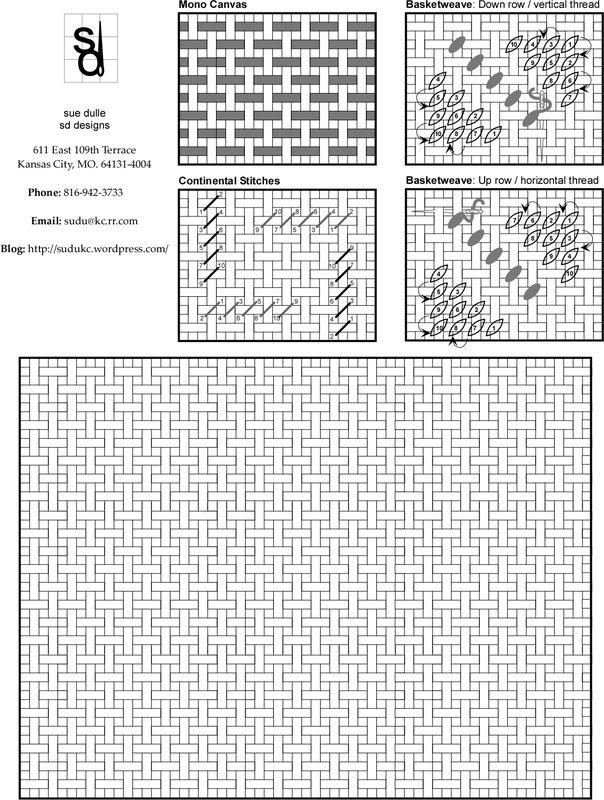 Think of basketweave as the foundation of the needlepoint house you are building…with a good foundation a needlepoint will stand for years. I always think of basketweave as learning to walk before you can run. It fall in the Midwest and beautiful and still baseball season, Go Royals (stitching my second baseball and will probably start third and maybe forth before “The Boys in Blue” win the World Series.) I hope you are enjoying the season no matter where you are, but think seriously about teaching someone to needlepoint.